April: 1; 8; 22; 29. May: 6; 13; 20; 27. July: 1; 8; 15; 22; 29. August: 5; 12; 19; 26. September: 2; 9; 16; 23; 30. October: 7; 14; 21; 28. November: 4; 11; 18; 25. December: 2; 9; 16; 23; 30. May: 1; 8; 15; 22. June: 5; 12; 19; 26. July: 3; 17; 24; 31. August: 7; 14; 21; 28. September: 4; 11; 18; 25. October: 2; 9; 16; 23; 30. November: 6; 13; 20; 27. December: 4; 11; 18; 25. March: 2; 16; 23; 30. St. Michael’s Church is a catholic church located in the heart of Budapest on Váci street. 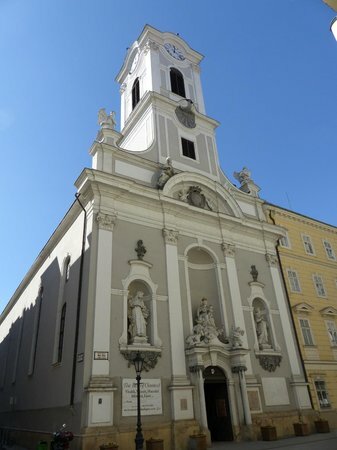 It was built in the baroque style by the Dominicans beween 1700-1765. After the Dominican Order was dissolved by Joseph II. in 1784 the church was given to the Order of St. Paul for a short period (1785-1786). In 1787 the Mary Ward Nuns got the church who operated a girls’ school in the building next door until 1950 when it was nationalized by the Communist Government. During the renovation between 1964-1968 the frescoes were whitewashed. Since 1997 the church has been under continous restoration both inside and outside. The beautiful main altar and the furnitures of the sacristy were made in the 1760s by the Dominican friars. Nowdays, due to its excellent acoustics and lovely atmosphere, St. Michael’s Church is one of the most popular places in Budapest to enjoy classical music concerts.